You can save precious time by viewing your campaigns cost data of more than 175 different ad networks directly from the AppsFlyer dashboard. AppsFlyer provides ROI reports to help app marketers measure the effectiveness of their ad campaigns. By combining in-app activity and lifetime value data with ad cost and other campaign details, AppsFlyer can deliver real-time ROI reports on app install campaigns. 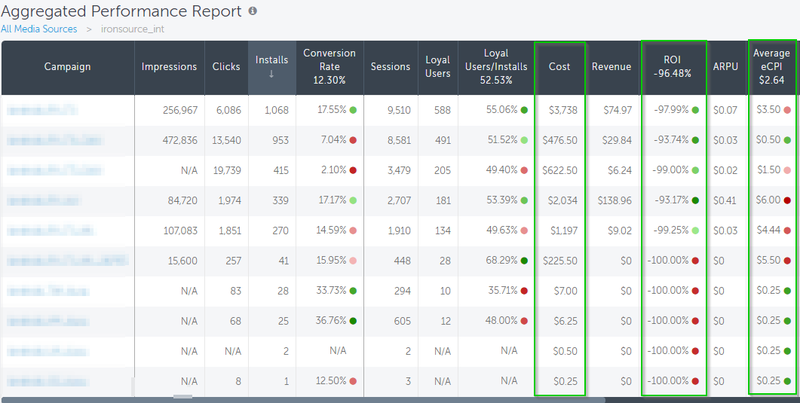 The ROI reports include additional data for measuring the effectiveness of your campaigns — campaign cost, clicks and in some cases impressions. Using the data, AppsFlyer also provides you with analysis of your campaign’s Return on Investment (ROI) and average Effective Cost per Installation (eCPI) over time. 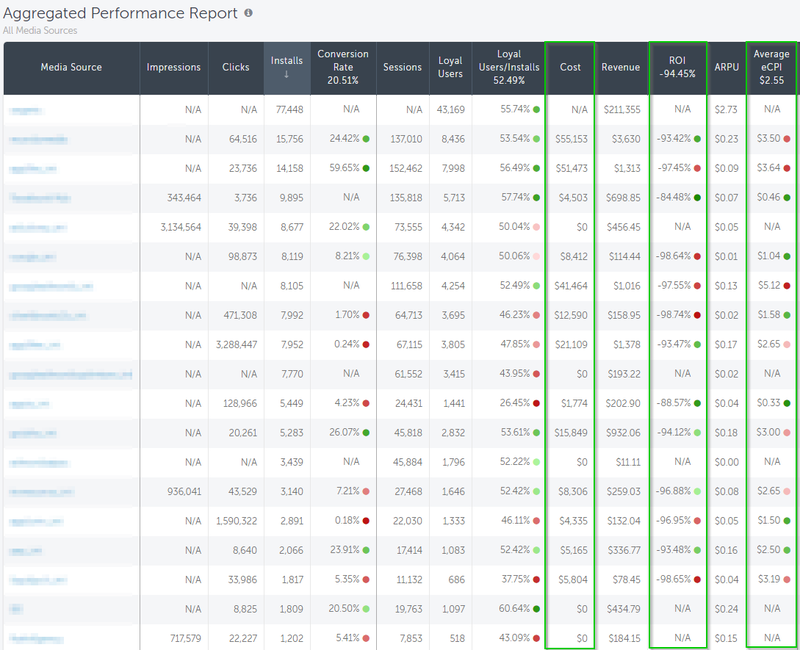 The cost, clicks, impressions, ROI, and average eCPI data are displayed on your dashboard in the Aggregated Performance Report table, as well as in the Partners and Partners by Date aggregated CSV reports. AppsFlyer provides campaign cost for more than 175 ad networks – among them Facebook (for more info on how to start receiving cost on AppsFlyer for your Facebook campaigns see here). For more details on configuring Google Ads, see here. See below for a complete list of the ad networks currently supplying cost to Appsflyer. API Media Source, Campaign and Geo. API Media Source, Campaign, Ad Set Level and Geo. API Media Source, Campaign, Geo, Ad Set, Ad and Channel. API Media Source, Campaign Ad Set and Ad. API Media Source, Campaign, Ad Set, Ad and Geo. You can stop fetching the cost data by manually toggling it off for the deactivated partner (where applicable). Once you set cost tracking with an API media source do not change the name of any running campaign, ad set or single ad as it may cause serious discrepancies or missing cost data. If the cost currency that is configured in the ad network is different than the currency configured in your app, AppsFlyer converts cost to the app's currency.